Rep. 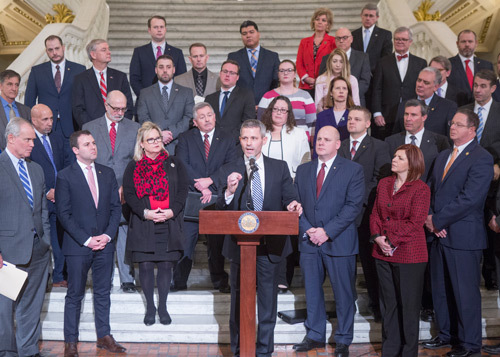 Rob Kauffman, chairman of the House Labor and Industry Committee, spoke about the importance of passing into law legislation to combat the significant overprescribing of opioids to Pennsylvanians within the state’s Workers’ Compensation system. HARRISBURG – House Speaker Mike Turzai (R-Allegheny), along with Rep. Ryan Mackenzie (R-Lehigh/Berks) and House Labor and Industry Chairman Rob Kauffman (R-Franklin), announced the latest House Republican efforts to strengthen the fight against Pennsylvania’s opioid crisis. Legislation was discussed to combat the significant overprescribing of drugs to Pennsylvanians within the state’s Workers’ Compensation (WC) system. According to a 2017 study by the Workers’ Compensation Research Institute, Pennsylvania is the second highest state in the number of opioids per claim, 87 percent higher than the median state. It also found Pennsylvania is the second highest state in the number of opioid pills per claim, at 258 pills, and the second highest state in the opioid dosage per pill, at 10.2 mg.
To address this problem, Mackenzie authored House Bill 18, a commonsense approach that would require the Department of Labor and Industry to adopt changes to the official state list of medicines, known as formularies, that may be prescribed for those within the WC program. A similar bill, Senate Bill 936, is also currently being considered. Currently, 21 states, including New York and California, have made similar changes to the lists that are used in most types of health care payment systems, including Medicare, Medicaid, the Children’s Health Insurance Program and group health insurance. Ohio implemented a drug formulary for Workers’ Compensation in 2011. By the end of 2016, it experienced a 51 percent reduction in the number of injured workers receiving an opioid prescription. It also saw the number of injured workers in the system who were dependent on opioids nearly cut in half, from 8,029 to 4,101. “The new lists, created by doctors, could reduce over-prescription of opioid painkillers by setting evidence-based standards for the medication that can be prescribed for a Workers’ Compensation patient,” said Mackenzie. “The lists of permissible medication would be continually updated and made available online for the general public to view. “In addition to over-prescribing, this legislation would address other prescribing abuses that are occurring within the system,” said Mackenzie. Creation of a statewide Prescription Drug Monitoring Program. A restriction on the number of pills that can be prescribed to minors in emergency rooms. Reclassified and redefined drug delivery crimes resulting in death from third-degree murder to a first-degree felony. Updated provisions and requirements related to the Alcohol, Chemical and Tobacco Abuse Program in the School Code to include other drug abuse. Instruction provided to students to communicate opioid abuse prevention, with an emphasis on the prescription drug epidemic and addiction to heroin. The establishment of a safe opioid prescribing curriculum in medical colleges and other medical schools. Provisions for emergency drug and alcohol detox in hospitals.